At least one sentence in a cluster is selected to be a representative sentence. The representative is the preferred wording of the sentence when several variations of the sentence exist. The Clusters Page displays the clusters within a reuse repository. The clusters page has the following parts. Keyword Filter Apply a filter based on keywords in the cluster . New Cluster Button Create a new cluster . Status Filter Apply a search filter based on cluster status . Cluster Size Filter Apply a filter based on cluster size . Cluster table columns Sort the cluster list. Edit Cluster button Add sentences to a cluster . Create as New Cluster button Create a new cluster from the selected sentences . Delete button Delete sentences from a cluster . Set Representatives button Change the representative sentences for a cluster . ​Active Contains buttons to control the cluster status. If both buttons are gray, the cluster has not yet been validated, and will not be used in a check. If the On button is green, the cluster is active, and the server will flag near matches. If the Off button is red, the cluster is inactive, and will not be used in a check. ​Representative Indicates the current cluster name. The cluster name is taken from the first cluster representative. The cluster name can change when users edit the cluster representatives . ​Matches Indicates how often sentences in each cluster where offered as suggestions in the Acrolinx Plug-ins. ​Last​ ​Detected Indicates when the sentence was last offered as a suggestion. ​Size Indicates how many sentences are in a cluster. ​Version The version number of the cluster and sentences. The version number of a cluster increases when you use the clustering wizard to merge new sentences into an existing cluster. Newer sentences in a cluster have higher version numbers. The cluster inherits the version number of the newest sentence. A representative sentence is the preferred sentence within a cluster. The Acrolinx plug-ins displays the representative sentence as a suggested replacement if a variation is found. During clustering process the Acrolinx Server selects the first sentence in the cluster with an Acrolinx score of zero to be representative sentence. The Acrolinx score ranks a sentence on how closely the sentence adheres to Acrolinx style and grammar standards. If a cluster does not contain any sentences with an Acrolinx score of zero, the cluster is not added to the repository. After you have created a repository, you can change the representative sentence or select additional representative sentences. You might choose more than one representative sentence if the sentences can be used in different ways depending on the context. You can edit clusters to change the way sentences are grouped and to select new representative sentences. After you review and edit your clusters, you can change the status of individual clusters to enable or disable them for checking. You can sort columns with bold headers in ascending or descending order. Column sorting is useful for validating large lists of clusters. For example, you can sort by match frequency to see the most frequently detected sentences within clusters. You can also filter the cluster list based on certain attributes of a cluster, the cluster ID, or keywords within the clustered sentences. Enter one or more keywords in the search field and click Search . Hinweis: Numerals are not recognized in keyword searches. For example, the search "4 fan trays" returns all sentences that contain "fan trays" but not "4 fan trays". Enter a cluster ID in the search field and click Search . In the Minimum Cluster Size field, enter the minimum number of sentences that a cluster must contain in order to appear in the search results. Select a filter checkbox to filter clusters by status. The Proposed checkbox shows clusters that are not yet turned on or off. The Enabled checkbox shows clusters that are turned on. The Disabled checkbox shows clusters that are turned off. After you activate a cluster and restart the language server, sentences that vary from the representative sentence are flagged when users check their documents. 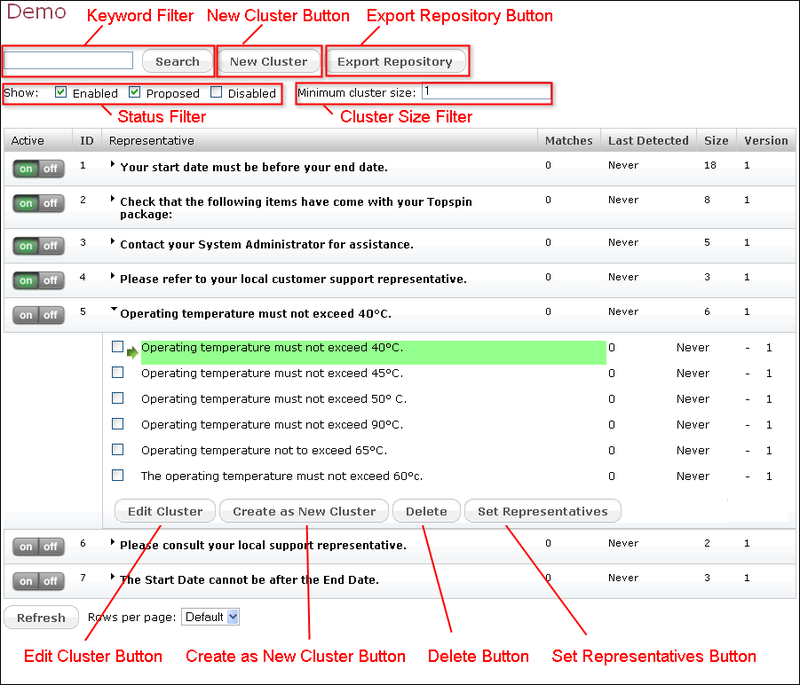 Click the On button to enable the cluster or click the Off button to disable the cluster. Restart the relevant language server to make your changes available for checking. You can also make additional changes before you restart the language server. You cannot delete a cluster because the cluster might be created again when you add new harvested sentences to your repository. When you disable a cluster, the cluster is not used for checking. A disabled cluster is also never re-created. By default, Acrolinx automatically selects a representative sentence when you create a repository. However, you can change the representative sentence and select additional representative sentences. Click the cluster name to see the sentences in the cluster. Select or deselect the checkboxes next the relevant sentences. Click the Set Representatives button. You can remove a sentence from a cluster if the sentence is not relevant to the cluster. If you notice many clusters that contain irrelevant sentences, you might need to adjust your cluster settings and create the repository again. Although the sentences are deleted from the cluster, they are still kept in the repository to ensure that they are not clustered again. Deleted sentences are moved to a new cluster with the status 'Disabled'. Select the checkboxes next the relevant sentences. After you click Delete , the removed sentence is moved to its own cluster that has the status disabled . You can add additional sentences to a cluster by entering a new sentence or moving an existing sentence from other cluster. To search clusters, ensure that a language server in the search language is running. For example, to search Japanese clusters, ensure that a language server configured with Japanese is running. To add a new sentence to a cluster, follow these steps. In the cluster list, expand the cluster that you want to edit and click the Edit Cluster button. Enter a new sentence in the Enter new sentence field. Enter a sentence or set of keywords and click Search Clusters . Select the sentences that you want to add to the cluster and click Move Selected Sentences . The selected sentences are removed from the clusters in the Clusters with Similar Sentences section and added to the Target Cluster . You can manually create a cluster to contain new sentences that are not in your repository. For example, you have a small document that contains variations of the sentence "Install gateways and switch cards". The sentences in this document were not harvested, but you need a quick way of adding the sentences to your repository. You can also create a new cluster if an existing cluster is too big and needs to be split into two smaller clusters. If you want your new clusters to be available for checking, ensure that you enable the clusters. To create a cluster that contains new sentences, follow these steps. In a repository, click the New Cluster button at the top of the cluster list . The cluster has the placeholder name "Missing Representative" until you add sentences to the cluster. Add sentences to the cluster . In the cluster list , expand the cluster which contains the sentences that will go into the new cluster. Click Create as New Cluster . The Edit Cluster page opens for the new cluster.